In a delightful little village just a stroll away from the Kennet & Avon Canal, the Three Tuns, Great Bedwyn, was erected in the mid-eighteenth century from the remnants of a local bakery and the morgue next door. It has now been given a new lease of life by its current owners Ashley and James Wilsey, who have carried out a sympathetic refurbishment whilst retaining the warmth and traditional feel of the establishment. The bar is a popular spot for a drink or a bite to eat by the open inglenook fireplace and cosy log-burner, or there's the back dining room with French doors leading into the garden. James Wilsey holds sway in the kitchen and his accomplished culinary skills have brought a breath of fresh air to the neighbourhood. First-class ingredients are locally sourced and everything on the menu from the bread to the ice cream is carefully made in house. Typical starters could be roasted scallops or maybe foie gras and duck ballontine, followed by a main course of crispy chicken thighs with peas, bacon and girolles. To finish look for delicious desserts in the shape of a traditional apple and blackberry crumble with custard, or chocolate fondant with cookie dough ice cream. 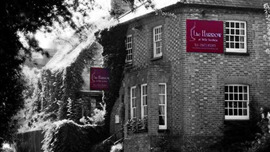 There's an excellent small selection of wine from around the globe as well as Real Ales, together with friendly service from the entire team at the Three Tuns. I visited The Three Tuns on my return from Cheltenham races, looking forward to a good meal, the starters of soup was very good, but when i got to the mains, in need of a good steak, it was very overpriced at £22. and very disappointing, lacking flavour and small, only to be served with burnt chips and a few paltry salad leaves. Really felt like complaining but the staff were to young to speak to!